What is Argentina? "Batter that has not become a cake", says Gabriela Nouzeilles and Graciela R. Montaldo in their co-authored book 'The Argentina Reader: History, Culture, Politics'. Argentina is the nation that used to be among the richest in the world, with the largest middle class in Latin America, yet that entered the twenty-first century seething with economic crisis and frustration. But Argentina is also a beautiful country that possesses stunning natural wonders- desert, mountains, lakes, glaciers, falls and oceans; a country that is refreshingly European with a passionate culture, not as European as it looks but offers a European-flavored sophistication; a country of misery and squalor surrounded by large extensions of fertile land- the other Argentina. And for most of us, Argentina is the birthplace of football legend Diego Maradona - a country where an interest in soccer may be all one needs to make friendship with the locals. Argentina is the third largest market of Latin America after Brazil and Mexico. It is rich in natural, mineral and energy resources. It has the eighth largest land area but a small population of 40 million. It was one of the top ten richest countries in the world before the Second World War and has the potential to regain its past glory. Argentina has now recovered from the crisis of 2001 (debt default, devaluation, financial collapse and political instability) since 2003. In December 2005, the government repaid 9 billion dollars of debt to IMF ahead of schedule and is now free from IMF intervention in its domestic policies. The external debt situation is under control now. Currency and Exchange rates have been stable since 2003. Fiscal deficit has been controlled and made into surplus. Exports are booming, thanks to the high demand and prices for Argentine exports. The recovery since 2003 is vigorous, strong and impressive. The government elected in 2003 completed its term and a new President, with comfortable legislative majority elected in October 2007. Political stability is assured for the next four years and prospects of long-term stability are good. The economy has one of the highest growths in Latin America with an annual growth of 8%.The growth is expected to be 6.5 percent in 2008. Foreign Trade: US $99 billion (exports: US $55 billion, imports: US $44 billion (2007). Argentina's foreign trade reaches 99 billion dollars in 2007. According to provisional figures, exports went up by 18% to 55 billion dollars and imports increased by 43 percent to 44 billion dollars. Brazil remained as the leading trade partner ( accounting for 30% of imports and 19% of exports) followed by China ( 11% of imports and 9% of exports) and USA( 10% of imports and 8% of exports). Top ten export destinations for Argentina in 2007: Brazil, China, US, Chile, Spain, Holland, Germany, Italy, Mexico, and Venezuela. Top ten Countries for Argentine Imports in 2007: Brazil, China, US, Germany, Mexico, Italy, Japan, France, Spain, and Chile. Trade between India and Argentina reached US $ 497 million in 2008 (January to May) of which India's exports to Argentina account to US $ 166 million while Argentina's export to India account to US $ 361 million. The textile and apparel sector has shown significant growth since 2002. During 2004, the textile sector grew 75 percent, the highest growth recorded for any industry sector in the Argentine economy that year. Positive activity continued through 2005 & 2006 due to consumption booms, driven by increased general purchasing power and rapidly growing inflows of tourists buying Argentine textile and apparel products. The total Argentinean textile market is estimated to be worth US$ 12 Billion. The clothing industry of Argentina is expected to grow steadily in the coming years in view of the growing demand for high fashion garments and its exports and the dynamic local retail sector consisting of local and foreign players. Argentina’s clothing preferences have leaned towards designs and brand names which are important, especially to the younger generation who are influenced by the US life styles and friends. The all Apparel industry is fragmented and more than 65% is run by small family units employing on an average 50 people. The Argentinean textile and garment industry though self sufficient to an extent still heavily depend upon import of synthetic fibres and fabrics and novelty items like accessories. They also concentrate on niche products. In view of the local designer and trendy retail stores, Buenos Aires is emerging as the fashion capital of the South American region. According to the Argentine Apparel Industrial Chamber, annual production of clothing items is valued at US$2.27 billion. The sector boasts about 11,600 manufacturing and design companies and 30,100 retail stores. The economical apparel sector reaches annual sales of about US$ 5 billion per year, and this figure is expected to rise. However, only one third of these sales are legally recorded due to the prevalence of informal activity. In terms of supplying the domestic market, there is a mix of methods applicable to the industry. Lower production costs have led companies from Brazil to install plants in Argentina. Most local firms carry out their manufacturing activity (raw materials and labor) in Argentina; other companies import fabrics, and/or send their designs overseas for manufacturing and receive the finished product (a method employed widely during the last decade) and a few licensees of foreign brands manufacture locally under an international label. Sub-sectors highly dependent on imports, such as sports footwear and high-tech apparel. The overall Argentina market for textiles and clothing import was valued at over US$ 911.55 million during 2005. MMF (Man Made Fibre) Textiles & Cotton covered under chapter 55, 54 & 52 constitutes majority of imports followed by Apparels (60, 62) and Made-ups (63) during 2005. From merely US$ 85.33 million imports in 2002, overall MMF textiles imports have grown nearly 287% to reach US$ 330.13 million in 2005. Muffler and Polyester blended fabrics. Selling to departmental stores, chain stores etc., is an interesting option. Between high fashion products and mass market products, there is an opportunity for niche markets which may be exploited by the Indian exporters. In Argentina, men wear stylish wool, blended suits especially in the winter months. For any season, dark conservative colours are most popular. Working women strive for simple elegance with conservative colours and styles. Trousers and pant suits are also becoming popular. Argentina and its MERCOSUR partners established a common external tariff (CET) on goods originating in non-member countries that currently ranges from zero to 22 percent for most products. The average import duty in Argentina is approximately 13.6 percent. A zero percent import duty for capital goods produced in non-MERCOSUR countries will remain in effect until December 31, 2008. According to World Trade Organization (WTO) regulations, textile imports from member countries are subject to a maximum of 35 percent of the value of the imported goods. The importer pays the higher of the two calculations: CET Ad Valorem (on FOB Value+Insurance+Freight) or weight (DIEM). Ad Valorem Mercosur Common External Tariffs (MCET) for apparel and textiles range from 3.5% to 21.5 percent. DIEMs are in force until 12/31/2007. Ad valorem (until 12/31/07): maximum 30% for some products and 35% for others. DIEMs vary ranging from $1 to $59 per kg. 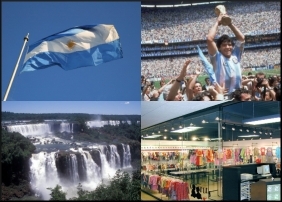 DIEMs or Specific Duties: Following the opening of the Argentine economy in 1991, the first specific duties for apparel (DIEM) were established in 1993 (a decreasing fixed rate, ending in 2007) thus slightly reducing the volume of imports. According to WTO regulations, all apparel imports from member countries are subject to a maximum limit of 35 percent of the value of the imported goods. The importer pays the higher of the two calculations: FOB value (Extra Zone -applicable to imports of products of non-Mercosur countries- 20 percent) or weight (DIEM). DIEMs vary according to the product (ranging between $2 and $20 per kilo), however, one should expect to pay around 35 percent in import tariffs. Argentina has restricted imports of used clothing and textiles, closeouts, irregulars, new and used rags, and scrap cordage of textile material wastes. The majority of agency and distribution agreements are flexible and can be negotiated individually. Most key Argentine importers are based in Buenos Aires, although a few of the larger organisations have branches in the provincial cities of Córdoba, Rosario and Mendoza. They generally opt for a network of distributors supported by travelling sales staff and rely on periodic visits from the provincial buyers to their HQ showroom in Buenos Aires. For certain product categories it is currently common practice to concentrate sales efforts on the Buenos Aires area to the detriment of the regions. Before establishing any formal agreements, it is important that Indian exporters analysis the sales coverage strategy of their potential representative. It is normal, but not obligatory, to give sole representative rights for the whole of the country to one agent. This may initially be agreed for one year with a performance-tied option to extend for a longer period. Whatever type of representation exporters may choose, it is strongly advised that the exporter visits the market regularly. Such visits are invaluable to the exporter to gain an appreciation of local market conditions, to oversee the work and support their local representative. The high level of sophistication in the market offers the alternative of licensing arrangements and joint ventures to develop business in Argentina and provide a gateway into MERCOSUR. This might be a logical second step for exporters, particularly if they have already established a firm and successful foothold in the market. Labels of all products commercialised in country should contain the name and description of the product and country of origin, and quality or purity and net weight if the product is edible. Labels should also be in Spanish or have a sticker/label with the above-mentioned information in Spanish attached to the package. Exterior packing cases should bear shipping marks and numbers on at least two sides (not top and bottom) with an indication of gross and net weights in metric units. Repetition of numbers in packages shipped under one bill of lading is prohibited. Labelling on products (preferably in Spanish) must indicate the country of origin, the quantity, quality, and the measurement or net weight unit in the metric system. Where applicable, the purity or mixture should be shown on the label. Importers are required to submit to the Bureau of Commerce and Industry samples of labels, container, wrapping and advertising material relating to any product sold at retail. Many products such as fruits and vegetables, textiles, hats, gloves, shoes, metal manufactures, bricks, tiles, glass manufactures, furniture, toys, paper products and fertilizers are subject to special labelling requirements which should be confirmed with the importers prior to shipment. In January 2002 the Argentine government overhauled its entire financial system and introduced a free exchange rate. After over a decade of the Argentine Peso being pegged to the US dollar ($1 = US $1), there is now a floating "free rate" for all transactions. (ii) payments cannot be made without proof of customs clearance or a legal commitment to clear from customs once the goods arrive. Original bill of lading, airway bill or parcel post receipt (depending on the means by which the goods are sent). Certificates of origin, stamped by the Argentine Consulate in London (see useful contacts section) are required for many products, for example textiles, clothing and all those items subject to specific duties). Safeguards are applied on imports of footwear, toys and several textile categories. Several product categories originating mostly from Brazil, China, Korea and Taiwan have been subject to anti-dumping and countervailing measures. In the particular case of the EU this affects imports of wheat gluten, olive oil and tinned peaches. Samples worth less than US $1000 ($2900 Peso) do not incur customs duty but do attract handling and storage charges. For samples over $1000 normal customs duties and clearance procedures apply. If samples are under the limit the package should clearly state "Sample with no commercial value" ("Muestras sin valor commercial" in Spanish). Exporters should avoid sending samples to potential customers in Argentina unless they are specifically requested to and clear instructions and delivery instructions agreed. Most companies will baulk at having to pay customs duties plus charges for samples they have not requested. From exports of merely Rs.23.10 crore in 2003-04, Indian MMF exports have grown 147% to reach Rs. 57.08 crore in 2005-06. Currently, India ranks 8th in imports of MMF textiles by Argentina. Since Argentina’s economy is expected to continue growing in the coming years due to rising consumption, increased general purchasing power and rapidly growing inflows of tourists buying Argentine textile and apparel products, there is good scope for Indian textile companies to increase exports to this country. Argentines are tough negotiators and personal relationships are important to develop before business is done. In addition, it should also be remembered that the pace of business in Argentina is slow and Argentines often need several meetings and extensive discussion to finalize deals.